As we head into those long, lazy months, with sunny, summer holidays on the horizon, it’s as good a time as any to give your bathroom a much needed makeover. In our latest Get the Look style guide, we’ll show you how you can create your own little haven that’s both shipshape and stylish. In part 1 of this style guide, I’ll be demonstrating a new take on the popular nautical style, with a look we’re calling “The Harbour”. Along the way, I’ll be finding out why nautical interiors remain so popular in homes up and down the country and supplying you with all the inspiration you’ll need to create your own design. So let’s set sail and discover more about this look. Why are nautical interiors so popular? Why do we continue to have such an enduring love of the sea when it comes to decorating our homes? This popularity may simply be a reflection of us as a people. The UK has always been a seafaring nation, with an outwards rather than inwards view on the world. Wherever you live, the sea is never too far away both physically and in our collective psyche, exciting us and inspiring us in equal measures. 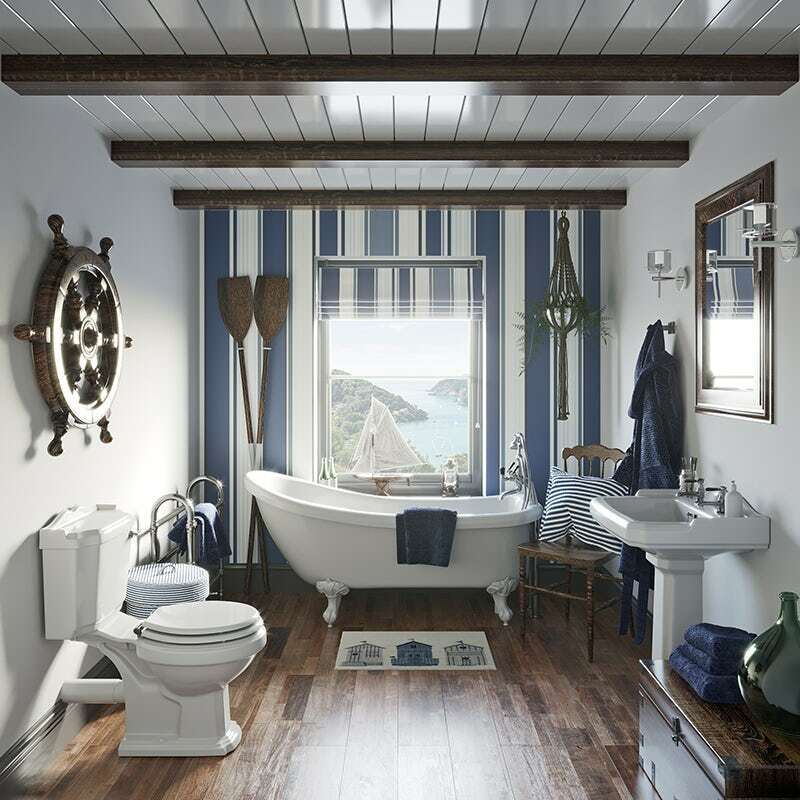 Having looked at recent interior design trends, it’s come as no surprise to me that the nautical look is more popular than ever. Which is why, here at VictoriaPlum.com, we’re getting set for the summer with a new nautical style that’s certainly more Yacht Club than Club Tropicana. What is The Harbour look? As we explored last year, when we revealed our Calming Coastal look, nautical-inspired décor can cover a broad spectrum of styles, colours and designs, from the more traditional to the very latest in contemporary trends. Away from all the retro seaside paraphernalia and lighter shades, The Harbour encapsulates a more refined and classic style, featuring a darker, richer colour palette bursting at the seams with navy blues and warm wood finishes. 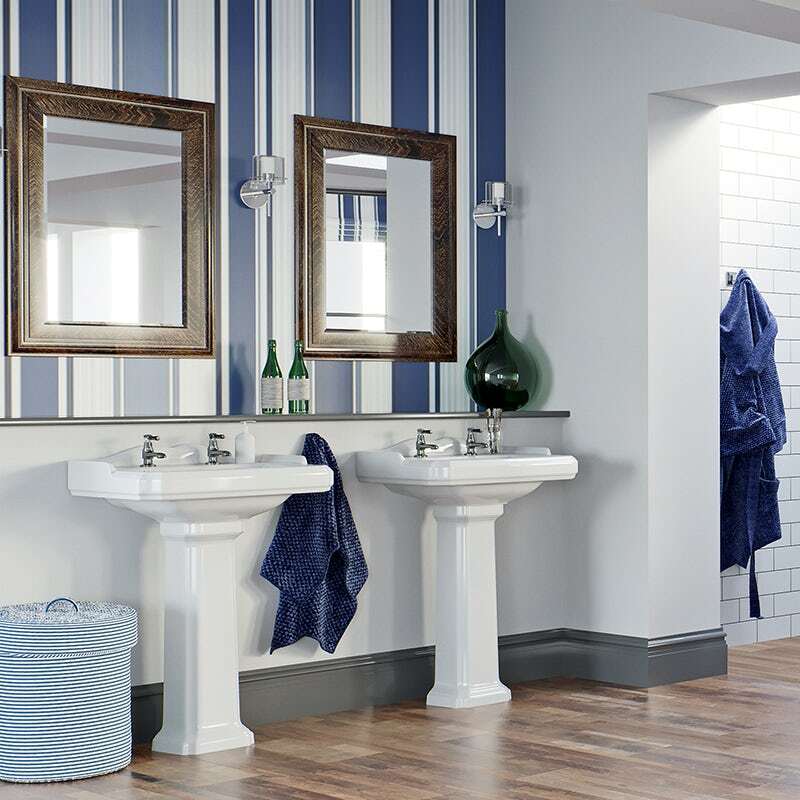 With a classic style, you’ll want to add some more traditional elements to your overall design, which is why traditional basins, toilets and cross handle taps lend themselves particularly well to this look. Dark wood finishes, like walnut, beech or oak combine perfectly with brilliant white tiles and striped motifs for a nautical feel that will certainly set you on the right course towards your perfect bathroom. 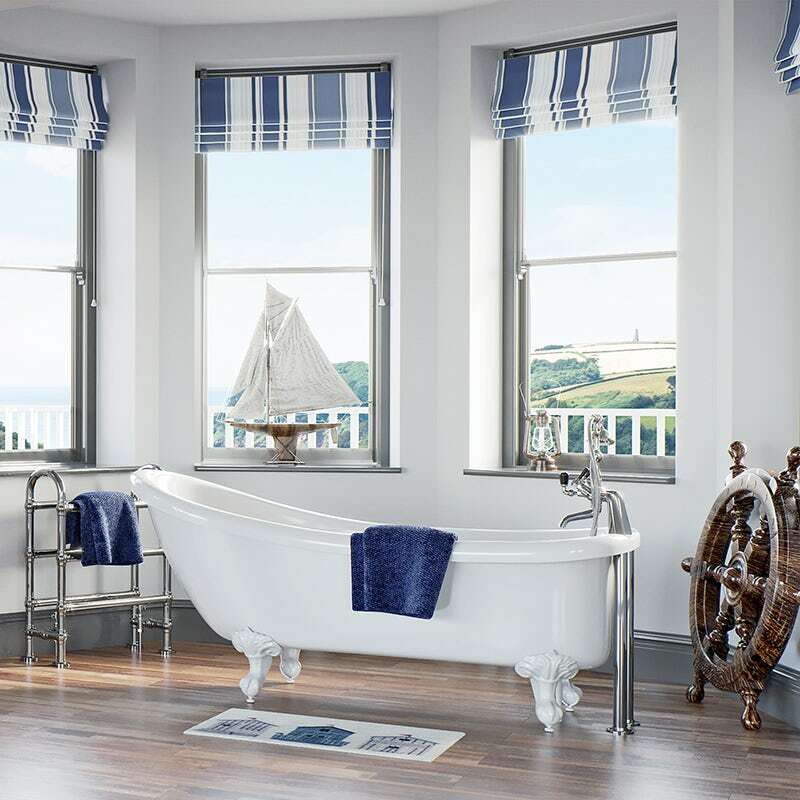 The Harbour look we created is perfect for a family bathroom, featuring a separate freestanding bath and shower area. To aid those early morning starts or evenings out, 2 separate basins have also been included. Your choice of colour is absolutely vital to achieving this look. We’ve opted for a dark navy blue and white striped wallpaper for our walls, combined with a lower half composed of pristine white paint. Following the 60-30-10 ratio, we’ve also added grey as an accent colour, appearing around the skirting board and window frames. The white bath and ceramics work perfectly with this palette. A darker wood will add a more natural feel to the overall look, as wood is a traditional material used in nautical settings (think the deck of an old boat). Whilst wood can be difficult to maintain, especially in the humid and damp atmosphere of a bathroom, there are ways you can fake this, by using wood-effect vinyl flooring, wood-effect tiles or even engineered wood furniture which is specially designed to be moisture-resistant. The Harbour is a more refined look than, say a seaside style. Therefore, you really don’t need to go overboard (pardon the pun) with the accessories you choose. One way of injecting a touch of classical coastal is to add some striped elements to your décor. In this instance, we found some gorgeous striped blinds for the windows, however, you could add striped towels, wallpaper, cushions or even decorate your ceiling. Of course, it's highly unlikely you'll own a bathroom the size of the one featured above. In fact, it is far more likely to resemble a dinghy rather than a yacht! That's why we've recreated the look in an average-sized space. 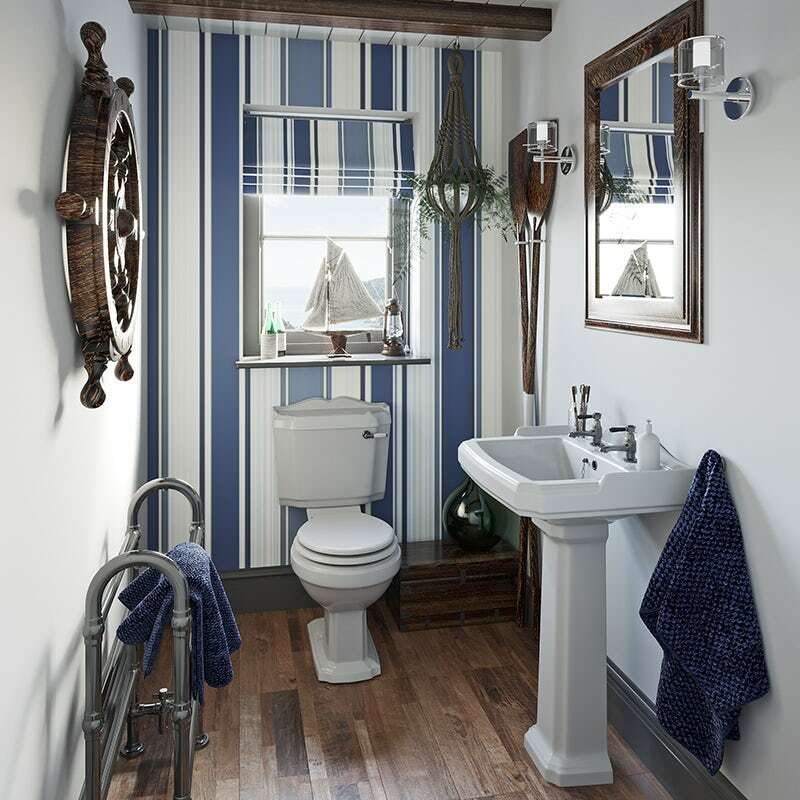 If it's just your downstairs cloakroom that needs a touch of nautical inspiration, it can be just as easy to achieve. Handy hint: You can discover more inspirational small bathroom ideas by heading to our Small Spaces hub. Head to part 2 of this style guide now, where I’ll show you the types of products you can choose to complement The Harbour look. 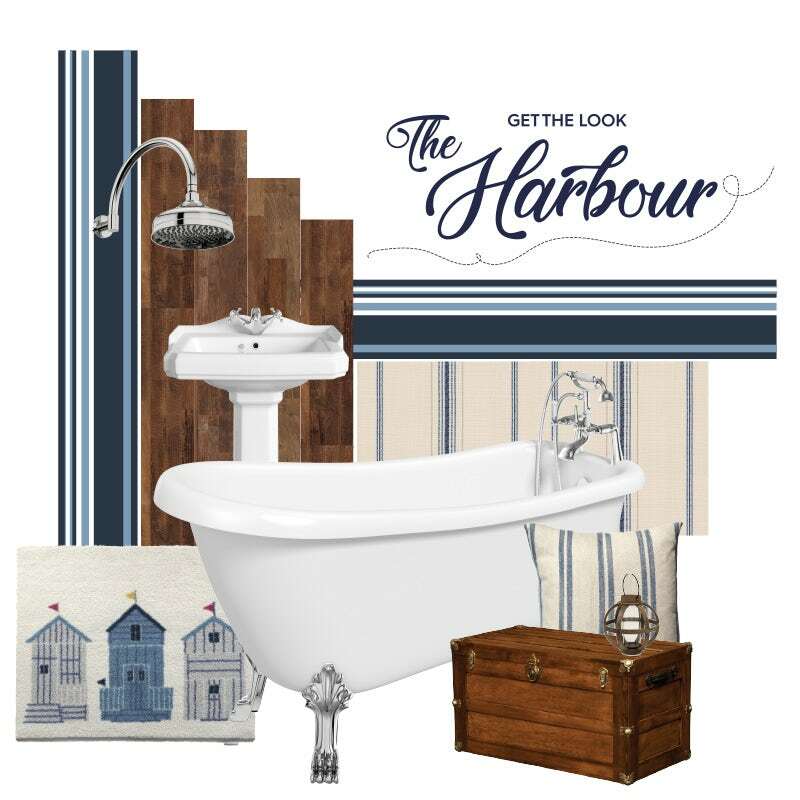 In part 2 of our latest "Get the look" style guide, I'll be showing you the type of products you’ll need to achieve The Harbour look in your bathroom. Ready to make waves with your new bathroom? In the final edition of our latest “Get the look” style guide, we'll show you exactly which VictoriaPlum.com products we used to achieve The Harbour look. Now for the fun part! 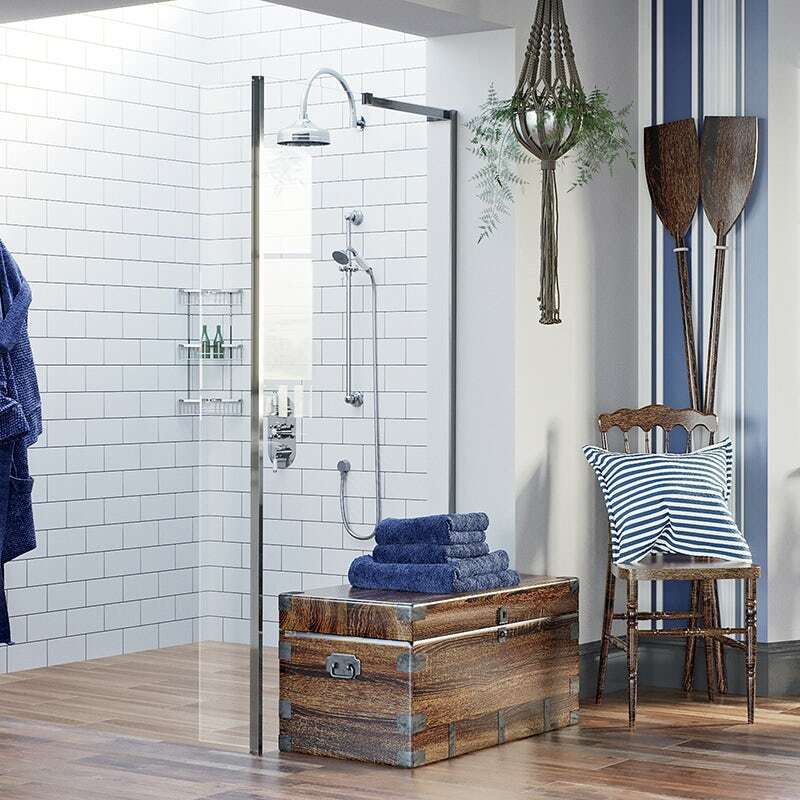 All aboard, as I show you how to accessorise your bathroom by picking the right colours, tiles and textures to achieve The Harbour look.